Expresssions of Women showcases local artists Geraldine Gaines, Kristin Pereira and Heather Williams. 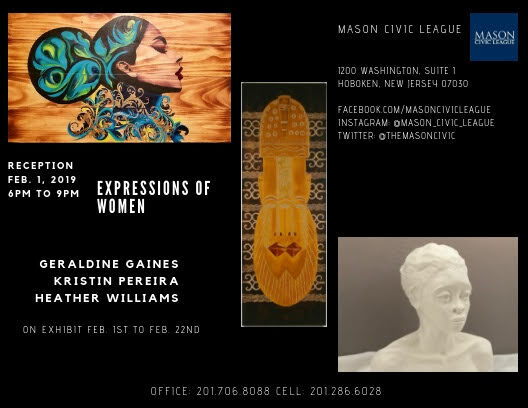 The opening will be Friday, February 1st, from 6pm to 9pm at The Mason Civic League located at 1200 Washington St, Hoboken, NJ and features paintings, sculptures and wood carvings. Mike Womack, a previous resident DJ at LITM is the guest DJ for the evening. The gallery is open Thursdays through Sundays and by appointment. Visit The Mason Civic League on February 1st to enjoy music, refreshments and an eclectic selection of work on display. The show runs through February 22nd. This event is free.